Salute to REH on his 111th. I need to pick out one of his works to re-read today. My Father bought me a copy of the Lancer, Conan the Adventurer, when I was in second grade. People of the Black Circle basically warped my young mind permanently. Thanks, Dad. 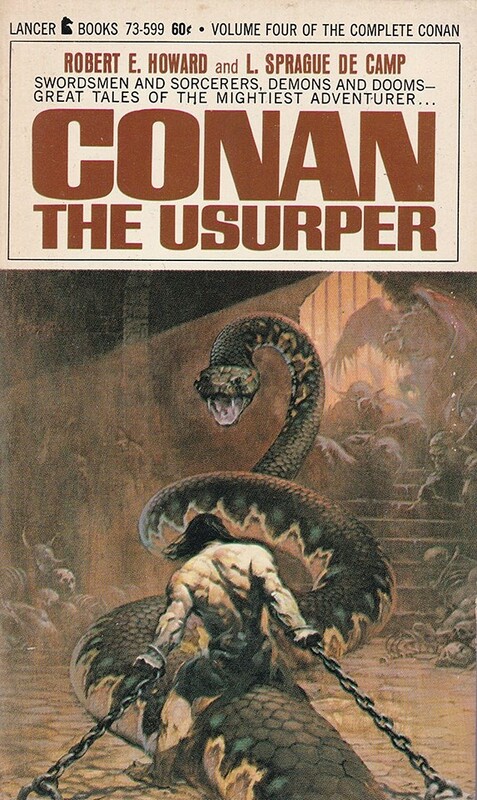 I think that's still probably my favorite Conan cover. Happy birthday, Bob. I discovered Howard in some of the SF digests in the '50s. I miss the old days. I drink to his shade, indeed. I was introduced to Howard via the Ace reprints of the Lancer originals. And frankly, I don't care about the deCamp/Carter influence on some of the stories. I own and appreciate the pure Howard material, but to a kid in the late 70's, the Lancer/Ace books rocked my world. Without them, I may never have discovered Howard, and I would have been poorer for it. The Lancers had great covers and I bought and read all of them in the Sixties. I'll always appreciate them for letting me discover Howard's work. I knew even then as a kid that I preferred the ones that were pure Howard--or close to it--but I never minded the pastiches and posthumous collaborations. Conan is one of the great hard boiled characters in fiction. In one story he is crucified, hanging on a cross when a vulture gets too close in order to peck out his eyes. Conan bites off the bird's head. Another scene I love is when he casually drops a naked girl into a sewer because she betrayed him.